The OPTIMAX® is an innovative table-top processor for film types up to a width of 14” (35 cm). The allrounder is used in various fields: Orthopedic, Chiropractic, other general radiography including mammography, in veterinary medicine as well as for laboratory and graphic arts applications. 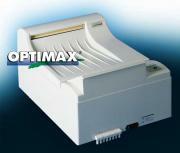 The OPTIMAX® is easy to service and presents itself with an attractive design. The one-piece casing and the exclusive use of high quality components guarantee the highest degree of reliability. It goes without saying that we supply the OPTIMAX® with everything that is needed for operation like light protection cover, replenishment containers and connecting hoses. This processor is a superior alternative to the Konica SRX processor! The integrated stand-by mode reduces your water and energy consumption. The film detection with a micro sensor enables intelligent and economic replenishment depending on the processed film surface. Because of that the OPTIMAX® saves chemicals and provides a constant high quality of your image. With the simple control panel the tanks can easily be filled during the warm-up cycle, and the developer temperature can be set. Acoustic and visual controls signal the readiness for processing of the next film. The anti-crystallization and anti-oxidation programs in combination with the continuous circulation of the chemicals and the thermostat for the developer ensure constant high image quality. The processed film is available after 90 seconds. Optionally, for special applications the processing time can be adjusted to 135 or 167 seconds factory set. (Must call to order with the optional processing time configuration). New OptiMax German made x-ray processor with standard equipment listed above and including: light tight lid, two 6.6 gallon replenishment tanks, hoses and manual for setup. Standard 1 year parts warranty. Factory set at 90 second development. 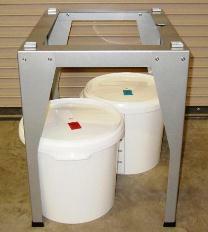 The Deluxe metal stand will fit the Proted ECOMAX, OPTIMAX, and EcoTank Processors. The new design easily contains the 2 replenishment containers underneath and has soft bottom leveling feet. This space-saving stand measures only 20" x 26" with a height of 26". Shipping weight is 22 lbs. Film format (L x W): 4” x 4” (10 x 10 cm) (3 x parallel) 840 films/hr. Film format (L x W): 9 1/2” x 7” (24 x 18 cm) (2 x parallel) 258 films/hr. Film format (L x W): 9 1/2” x 12” (24 x 30 cm) 129 films/hr. Film format (L x W): 17” x 14” (43 x 35 cm) 75 films/hr.